Hey everyone...Julie here with a BBB update! I went to Business by the Bay last night at the Tampa Bay Performing Arts Center (soon to be known as the The David A. Straz, Jr.
Center for the Performing Arts in the Carol Morsani Hall and had an ahhhhhmmmmazing time. Waiters delivered appetizers as people sauntered around and mingled. The setting was beautiful. The energy of so many performers and dancers and technicians all devoted to your entertainment swirls around the room and you feel as though you play a distinct part in bringing all of the effort together and landing in that one spot. This space has an unmistakable wondrous atmosphere about it that takes your breath away. Which is why this is the perfect setting for the premier of Wonderland: Alice&apos;s New Musical Adventure, produced by our very own Tampa Bay PAC! It was nice to see Lovelynn from Grand Events of Florida: Creating Grand Environments for 20+ years in the for Tampa Bay Resorts, Tampa Bay Meetings and Tampa Bay Conventions. Professional event design and production, decor, lighting, A/V, entertainment, custom fabrication and sewing, stage design, live foliage. And Louis from Nola Cafe and News Stand: Featuring a full list of signature coffees, beignets and only the most authentic New Orleans fare. Relax in the French Quarter atmosphere, listen to New Orleans jazz and blues and enjoy a cup of café au lait and beignets. 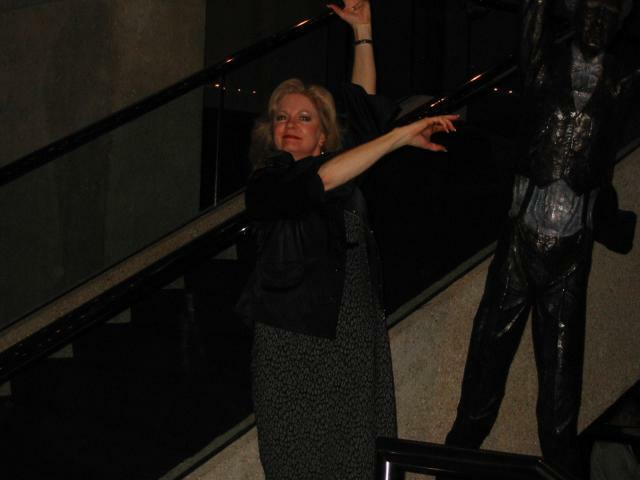 And of course no event would be complete without Dianne striking a pose! This picture just HAD to be included! I&apos;m sure it is of no surprise to you that Paul had his hand in goading her on! With the appetizers and free drink ticket and Tampa Bay & Company&apos;s very own Jeremy Fairley on hand to help you get started with social media in your own organization I think people felt the time was certainly well spent. If you want to come with me and have a great time the next Business by the Bay is at The Lime 915 S Howard Ave Tampa, FL 33606; Tuesday December 8th from 5 p.m. to 7p.m. Until the next time, stay tuned for more of my updates on fun filled things to do in Tampa Bay!